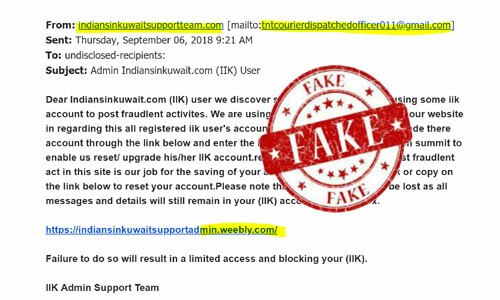 A new mailspam campaign is underway that pretends to be a mail send from IndiansinKuwait.com. The mail targets IIK users and pretend it as send from IIK to collect the login information of users IIK account. Many people informed IIK that they get such emails and many prey victim to the scam. What about fake advts in Classifieds?